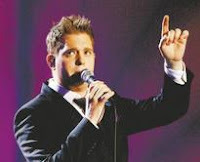 Michael Buble managed to nab two awards at the fourth annual Canadian Smooth Jazz awards. He walked away with vocalist of the year and best original composition for his famous song "Everything." I don't know if anyone actually listens to smooth jazz. Smooth Jazz is the music you hear while some cute hygienist is cleaning your teeth. Real jazz is the music you are proud to say you listen too. Smooth Jazz is the music you try to think over when the co-worker in the cubicle next to yours decides to turn up their radio. Mike plays Green Bay's Resch Center on April 23rd. The Resch Center ticket holders for that show are a range of young and old. Perhaps the snow will melt by the time Mr. Buble's dreamy smooth Jazz vocal styling drifts across the Resch Center and into the ears of all those Smooth Jazz fans.